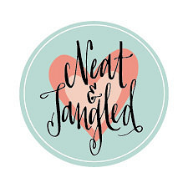 Today is a special day for a blog hop! 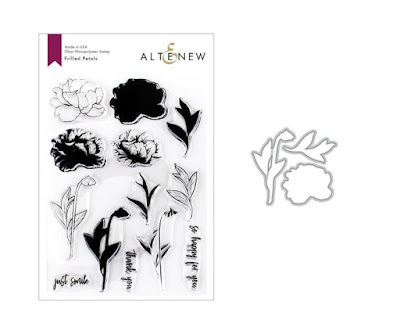 Altenew has released 11 Build-A-Flower sets so far since March 2017. You should arrive from my dear talented friend Alice Wertz's blog. 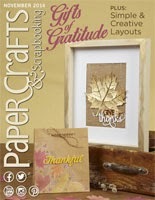 For all the details and inspiration of this blog hop, please check out Altenew Card Blog and Altenew Scrapbook Blog. I have chosen TWO favorites: past and current. 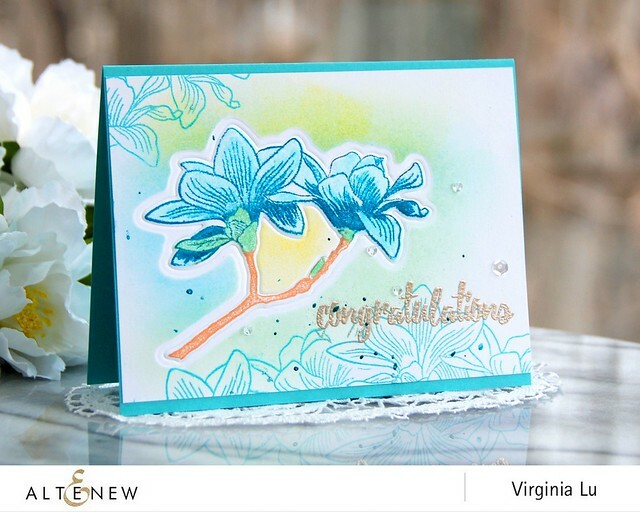 Build-a-Flower Magnolia has always been such a fun one to stamp. This card involves color-layering, masking, dry-embossing, ink-blending, embossing and die-cutting. 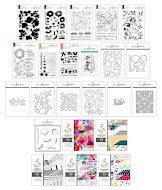 It is SUPER easy to line up the images as I never need the guild to help me as the stamping is so intuitive! For the current favorite, I am using the latest release "Peony Blossom" Set. 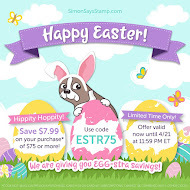 Simon Says Stamp Shop here. My peony blossoms are actually made with vellum! They are double-embossed! First, I did the white embossing with Pure White EP and then colored the flowers on the backside with Altenew INK ( Tea Party Oval Set). The ink on vellum would stay very wet and that's when you add Crystal Clear Embossing Powder. Once you ran through the heat gun, the vellum will become thicker and shinier! The clear-embossing really makes this card pop! I was quite pleased how this turned out! 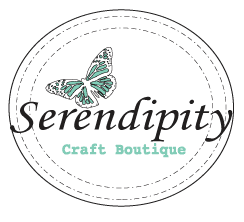 It is almost always a good idea to try different ways of embossing. I hope that you like the two cards I share today! I highly recommend the Build-a-Flowers set (all links are at the end of this post) if you have not got any yet. 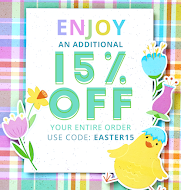 Don't forget to check out Altenew SALES here. Giveaway 1: Altenew is giving away a $30 gift certificate to six lucky winners. 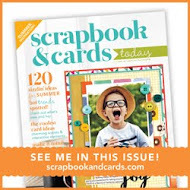 Please leave a comment on the Altenew Card Blog and Altenew Scrapbook Blog by March 2nd for a chance to win. 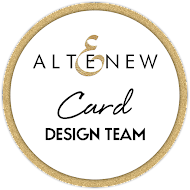 Six winners will be announced on the Altenew blogs on March 4, 2018. 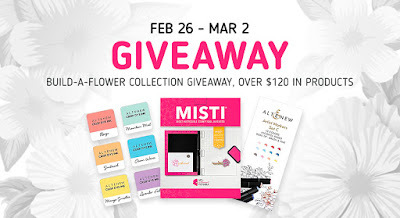 Giveaway 2: Place an order from the Build-a-Flower Collection from Feb. 26th till March 2nd, and you will automatically be entered into a prize pack valued at over $120 including one Original MISTI Stamping Tool, Artist Markers Set C and Soft Pastel 6 Mini Cube Set. No minimum purchase needed! 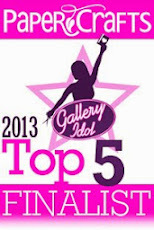 A winner will be announced on March 4th on the Altenew Blogs. 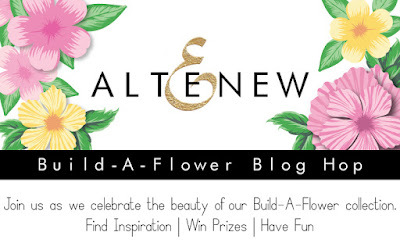 Giveaway 3: Comment in this blog and you are also eligible to win $20 Gift Card from Altenew. Winner will be announced on Mach 2nd right here in this blog. Your next stop is the fabulous Kymona Tracy's! I absolutely love your cards. You ave given me great ideas and can't wait to try them. 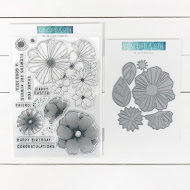 These are the best flower stamps! 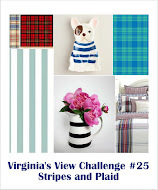 I always enjoy your floral cards Virginia! These are beautiful. I especially love the second one! Beautiful coloring wit my favorite stamp sets...thanks for lovely inspirations!! Very beautiful cards. I really love this series! SO beautiful. I would love to see a video showing how you did the vellum flowers. I think I understand, but this is one of those that watching might make it easier to understand! They are amazing. Thank you. The Peony Blossom card is so pretty. The vellum keeps it soft and looks cool. You chose two of my favorites, too. Essentially, for the same reasons you listed. My peony set is winging it's way to me as I type. I can't wait to try your embossing technique because the second card is as spectacular as the first one. I would not have thought to stamp the magnolia in blue, but it's really beautiful that color. You're a fabulous teacher. I have learned many different techniques from you. I don't have any of the flowers from this series but your old favorite is one of mine also. Embossing poweder on the BACK of the flower?? Genius!!! 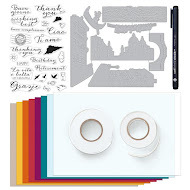 I will have to try that next time I’m using vellum for florals, sounds like a fun technique! I LOVE the second card the best. I love how you embossed it, beautiful!!! I haven't heard before of embossing over the color on the backside of vellum. I want to try it! Plus, your card is just beautiful. Thank you. Beautiful cards. I am especially enthralled with the your peony blossom card. A delightful, colorful card. Love the flowers on vellum. Thanks for sharing. Love the color combo on your first card. Love the embossing on the vellum, so so pretty! I am going to have to try it. Gives it an amazing look. LOve these floral builder sets! Your current favorite is my favorite too. Wonderful cards. Love the BAF Magnolia and Peony Blossom sets you used! Beautiful cards! love the vellum peony flowers you created! Love the white on the pink. So stankin purdy! Love the white embossed Peony card from the latest release from the Peony Blossom stamp set. I love all of your cards!! My fav is peony blossoms. But I love the other too! Beautiful cards, once again, Virginia! Love the BAF sets from Altenew! That is a stunning technique. I'm going to have to try that! 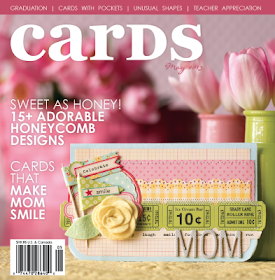 wonderful cards, Virginia - especially love your peony blossom card! These are so stunning!! The flowers look amazing!! I love the designs!! I would never have thought of the embossing powder on the back of the vellum letting the shine co?me through. What will you think of next? Beautiful cards. Your vellum flowers are quite lovely, with vibrant eye-catching color. Love them! Will have to try some, although I don't have this set. Oh man! It must have been difficult to pick a favorite! Lovely cards! The color palette that you used for your first card is beautiful! Love your peonies. You hit it out of the park with the vellum. It is beautiful. Love the peony card, the embossed vellum is beautiful! I love all the Altenew build a flower sets.. While the 3D ones aren't me, they are beautiful on the finished cards. so glad they will continue the project. Beautiful cards! Thank you for sharing your creative talents with us. Lovely cards! What a great way to showcase these beautiful flower sets! The Peony set is my favorite. Love how you did it with Vellum. You always make such lovely cards. Thanks for showing more of the Build a Flower examples. Both of you cards are beautiful! I love your color choices and the flowers on vellum are particularly lovely. I'm not sure I've seen the magnolia flower before but it is lovely! Such beautiful aqua and teal colors you used! And what a great idea to emboss the vellum for the peony blossoms! 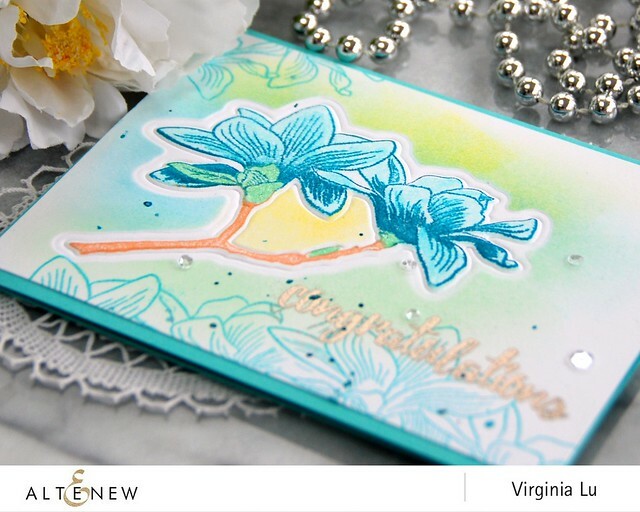 Gorgeous cards, Virginia! Those vellum peonies are incredible, love all the texture. I love the softness of the flowers you created. The colors are great and the cards are beautiful. Thanks for sharing! Both cards are stunning love your color selections and layouts too. Wonderful cards! I like your technique of embossing on the vellum using one of the stamp layers and colouring the back — adds to the versatility of these images. Beautiful cards! I love the magnolia in blue. How fantastic to double emboss the vellum. Ah, your peonies, my friend. They actually remind me of hibiscus, but in any case of summer. What a beautiful card. Love your blue take on the magnolia too. The peonies are my favorite. These are all just gorgeous. Your projects are very inspiring, beautiful and stunning!!! I love peonies and so looking forward to see more Spring flowers!!! I love how your flowers turned out! :) Great job! Virginia, you always bring us amazing technique and stunning beauty! Gorgeous blooms today! Very lovely. I really enjoy seeing so many ideas with these sets. Very pretty floral cards. I like the double embossing on the vellum. Beautiful cards, Virginia! The peony blossom is my fave set and you have showcased it beautifully. One quick question - did you emboss the back of the flower after inking it? So, you embossed the detail on the front of the vellum and embossed the entire backside after inking - right? You are always so creative and inspiring!! I would agree it would be hard to pick a favorite Build a Flower set! 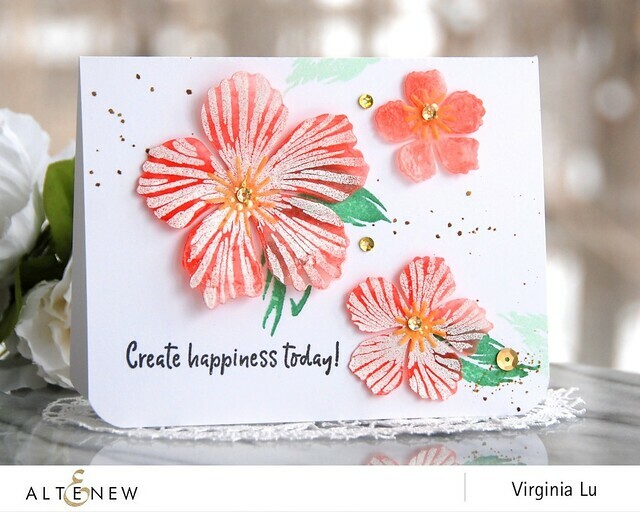 I absolutely love the card you have created with the Peony Blossom set for this Blog Hop. 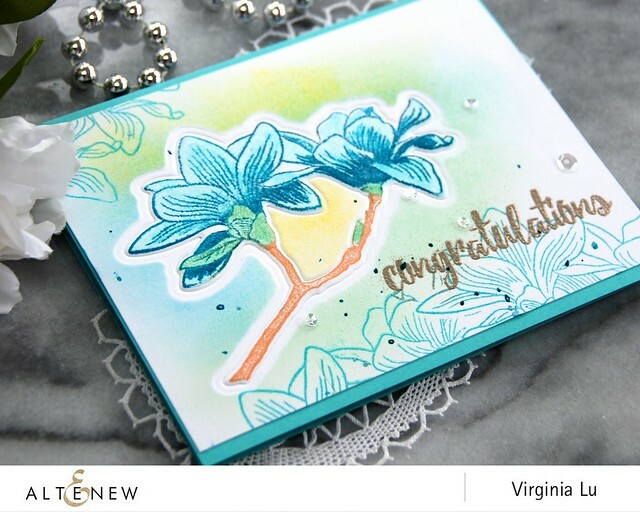 I love the alcohol inks and the embossing and love the way you used the vellum for this and other cards that you have done recently. You are the designer that has inspired me to bring out the alcohol inks again. Lovely card, thank you so much! Such beautiful cards! I love the Sakura blossom card. So pretty. Your cards are beautiful--the aqua one is simply gorgeous! Beautiful cards! Love those vellum flowers! Such pretty cards - love the colors. Your cards are magical. They pop right out at you. The colors are so vibrant. I'm loving the flower theme because it's only 21 days until spring. So excited! I love the white embossing on the peonies. And your first card is so unique and different from anything else I've seen lately. Beautiful! Must try that masked inking with the dry embossed technique! Looks fabulous! I love both of these sets and your cards are gorgeous, particularly the Peony Blossom. I love how those peonies turned out on the vellum with the white embossing on the front! I would never have thought to do that, thanks for the inspiration! 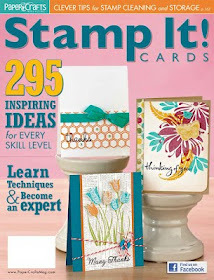 I can't wait to try that technique when I get my stamp set in! Love the colors and oh those flowers are beautiful. Love your card. I need to try this on something I have. The magnolia set is my favorite. I bought that one and was inspired by your original card with that stamp set. 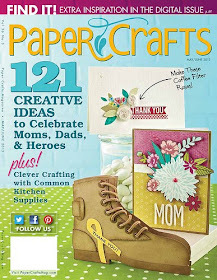 This is beautiful, too, and I love the dry embossing instead of raised diecut. Great job! Your cards are beautiful . These are such beautiful cards, Virginia. I appreciate you sharing your process, especially explaining how to work with the vellum. Thanks for your card and tutorial. Beautiful flowers and coloring! Thanks for sharing! I love the color choices on the first card. Very unexpected (at least for me). And I also appreciate the "throw all the techniques at this card!" approach. I'm a little jealous of your ability to make it look like a cohesive card, because when I try that, it looks like a craft store exploded on my card. :/ And I will always enjoy the embossed lines on that peony blossoms. I really thought that it was a pearlescent powder, but it's just the effect of the vellum. So cool! 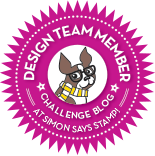 I always learn so much from your posts, so thank you for sharing and participating in this bloghop. Both your cards are beautiful but I especially like the magnolia one! Beautiful cards! Amazed at the flowers out of vellum too! Beautiful cards!! The spring like colours on your magnolia card are quite different but I quiet like it. And that peonies card is just simply gorgeous!! So bright and beautiful. Thank you. Fabulous cards, they are a feast for the eyes! Thanks for sharing your techniques as well. Absolutely love the peony blossoms - so super clever and beautiful. Thanks for inspiring me. Great card. Love the flower stamp. Beautiful magnolia Card, love the sentiment sin that set too. The peony blossoms out of vellum and double embossed are soooo gorgeous! Thanks for your photo heavy post, lol! Your cards are beautiful! I love the way you did the Peony Blooms. Wow, youve used both the sets I love , great cards thank you. Wonderful cards, Virginia! I love that you've used two different sets. They're both gorgeous! I especially love the vellum flowers! I'll have to try stamping on Velum! Both there cards are amazing.. I never use vellum for my Florals because of the ink staying so wet. I never thought to use the clear embossing powder to solve that problem! I think I may have to buy stock in a vellum Company because I think I will become addicted to this technique! Your card is stunning and I love it! TFS! I just purchased the Magnolia set. Love your card with this. And the peonies on vellum double embossed are stunning. Very pretty cards! I especially love the vellum flowers, so pretty! Your cards are stunning! I love those vellum flowers - I must try that double-embossing technique! beautiful cards! 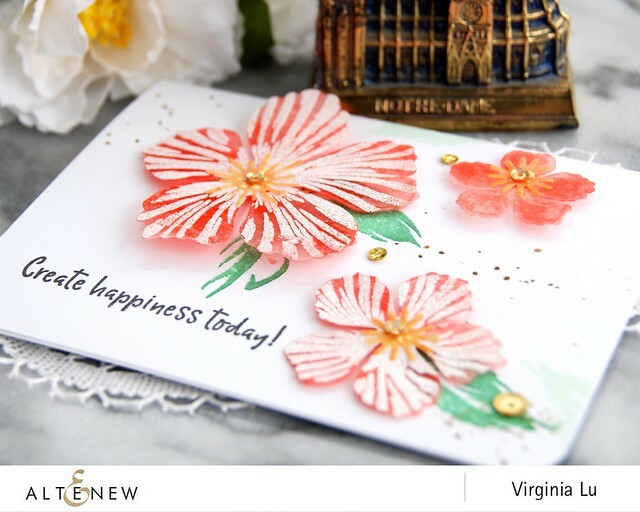 I love the vellum flower idea! Your vellum flowers are fabulous! Thanks for the idea. I love your cards and I want a die cutter, then I could make cards like you did. The card done in blue is so stunning and I like all the shades of blue in it. There is also some of my favorite color in the whole wide world, yellow. I love the orange flower card. The gold insides on the flower and on the card are very nice. I love the embossing too. 2 very pretty cards for 2 very nice people. 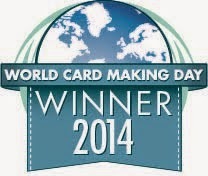 Thank you for showing us your cards and for giving us the chance to win something. love your cards the design is awessome.